I can hardly thing of a lovelier harbinger of the Lunar New Year (aka Chinese New Year) than a fabulous block print postcard from Carroll. She has sent me countless gorgeous things over the years, and I haven't even blogged about them all. 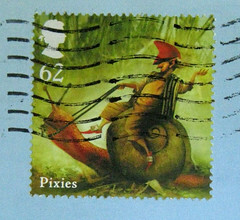 She does hand-carved stamps, block prints, paintings, drawings, collages - and what else? Probably everything. I admit I don't understand the detailed process of block printing, not really, but you can take a look at a great photo of her process on her Flickr. 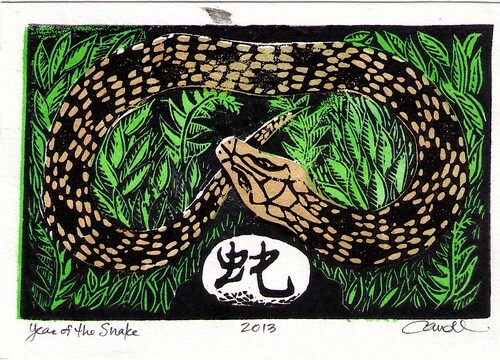 The scan doesn't do justice to the golden snake in the green, green grass. 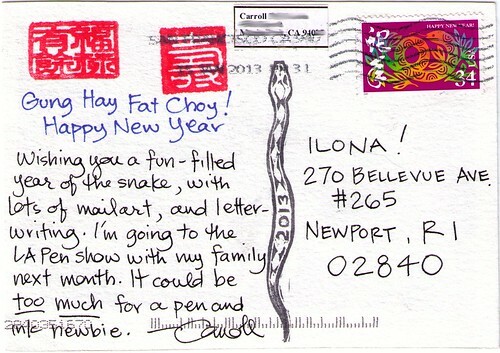 It's not only the front that's fabulous, of course - she used a delightful older Year of the Snake rainbow 34-cent stamp, and her own hand-carved 2013 Year of the Snake stamp (I assume she carved it, she's such a fine stamp carver). Carroll, you could sell this stuff! In a comment on my photo, she noted "The skinny snake carving is made on a scrap from the soft block I used for the big snake on the front. Rubber stamps by Design in Squares and Kodomo say 'Having Plenty' and 'Long Life'." And, she's headed to the L.A. Pen show soon. Who's envious? ME! Wow, that's lovely! Thanks for sharing it!